Bring the kids to Eckert's Annual Breakfast with the Easter Bunny at Eckert's Farm - Belleville. Enjoy a family-style breakfast with all the fixins! $6.99 per child/$12.99 per adult. Call 618-233-0513 x 3 to make reservations. See website event listing for more info (Register for the Easter Egg-Citement Easter Egg Hunt, too!) These events take place on Saturdays and Sundays, April 6th, 7th, 13th, 14th, & 20th, plus on Good Friday, April 19th. 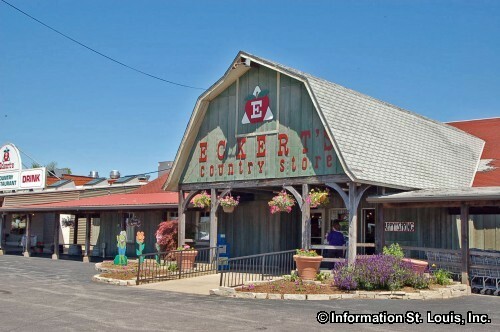 Visiting Eckert's in Belleville is a fun way to spend a day for the whole family! During the growing season, kids love to ride the wagons out into the fields to pick fruits such as apples, peaches or strawberries. Eckert's has pick-your-own pumpkins and Christmas trees, too! Seasonal activities include hayrides, craft making, wreath making, summer concert series, breakfast with Santa or the Easter Bunny, photo contests and more! There are three Illinois locations, the Belleville Farm, the Millstadt Farm and the Grafton Farm. Eckert's has the great distinction as being the largest pick-your-own orchard operation in the United States. Directions: From St. Louis: From Interstate 64 go East and exit on 255 South. Continue on 255 South for approximately 3-4 miles, and then exit on Illinois Hwy 15 East to Belleville, Exit number 17A. Continue on Hwy 15 East for approximately 11 miles, see Orchard sign, and make a left off 15 East into our parking area.